Reliance Communication who initiated the cheap handset offers by bringing in Classic monochrome handsets, priced at Rs 777, introduced a new color handset priced at Rs. 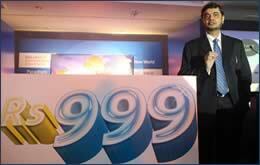 999 called the “Classic 732”, which it claims to be the cheapest color handset in the country. The phone features a large phone book, SMS on call reject, and speaker phone. The phone also features a color display and FM. The handset promises too much for 999 and if it is able to fulfill these promises then the handset would soon become the entry-level handset for every new mobile user in the country.